Ogle a hippopotamus. Then eyeball a whale. Admit it: you don't see much in common. But then look at their DNA, and the link is unmistakable: About 20 years ago, with the explosion of genomic studies, scientists realized that the four-footed, lake-dwelling mammal and the goliaths of the ocean shared a common ancestor about 52 million years ago. The genetics were transparent, but the fossils were opaque. Plenty of fossils of whales (and their fellow cetaceans, the dolphins and porpoises) were found. But a huge hollow in the history of the hippo remained -- a gap of 33 million years. This week, in Nature Communications, a group from France and Kenya reports that two teeth found in northern Kenya in 1994 represent an early ancestor of the hippo. The critter, named Epirigenys lokonensis, likely weighed about 100 kilograms and "was quite small, like a big sheep, was an herbivore, it ate only plants, though we don't know if they were fruits or leaves or both," says first author Fabrice Lihoreau of the University of Montpellier. Simplified phylogenetic relationships between hippos, anthracotheres and cetaceans shows the key position of the new species from Kenya, Epirigenys lokonensis. This animal lived about 28 million years ago. Future isotope studies may clear that up whether the hippo ancestor lived part- or full-time in the water, says Lihoreau. However, since the joint ancestor of cetaceans and hippos arrived from Asia when Africa was surrounded by water, it must have been aquatic. View of the upper molar of Epirigenys lokonensis before preparation (scale bar =1 cm). We asked what they found, and Lihoreau responded, "We only have two teeth, and a small fragment of mandible," for the type (reference) specimen. 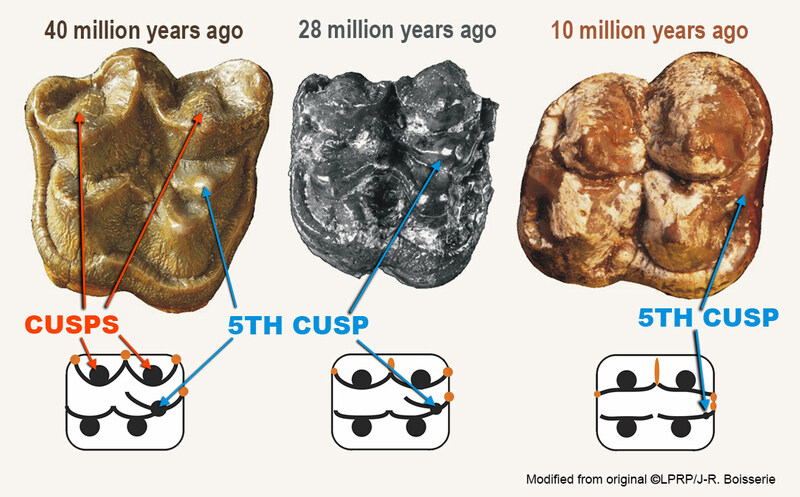 Other teeth, representing about 20 individuals, were also recovered from the site in arid Northern Kenya. 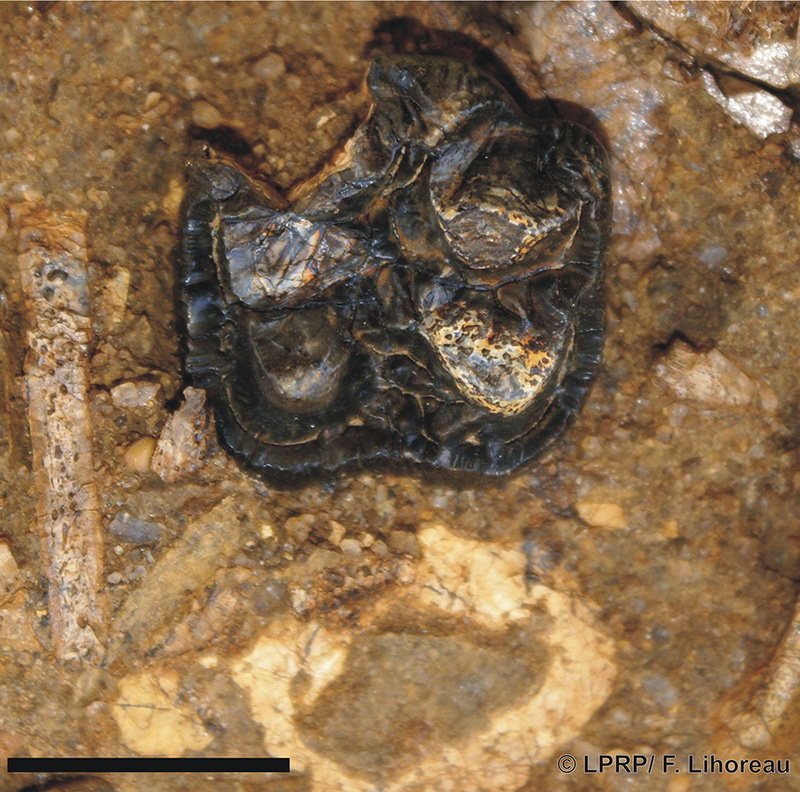 Teeth fossilize well because they contain a higher ratio of mineral than bone, Lihoreau explained. "They are very hard, our teeth are only 5 percent organic matter, so they don't change much when they fossilize. In mammal fossils, we usually find only teeth remaining, but they are very peculiar for each taxonomic unit," such as species or genus. "Teeth are very important, more than other parts of the skeleton. When we find a complete skeleton we are very happy, but sometimes even then, we focus on the teeth. Describing teeth is a very good way to describe a species." Diet is the biggest factor in tooth evolution: The cutting teeth of carnivores are radically different from the grinding teeth of herbivores. The development of the skull and behavior can also change the shape or number of teeth, Lihoreau said. 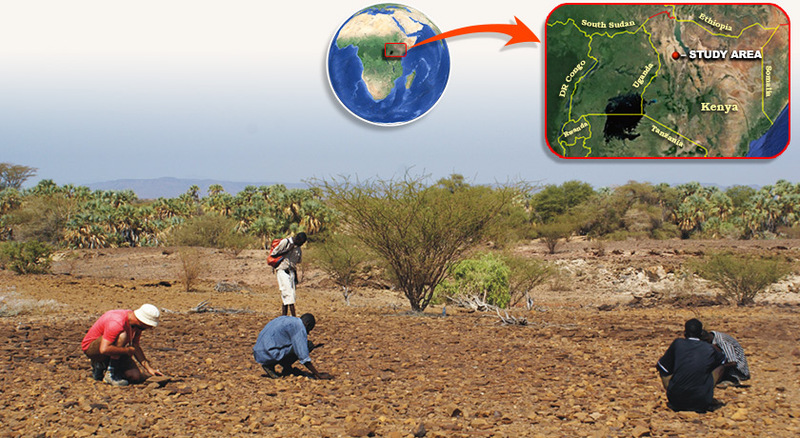 Locator map of Lukichar basin, Kenya where fossils of ancestral hippos have been retrieved from Oligocene-age sediment. Photo: field investigation by the Franco-Kenyan team in the Lokone site, which yielded fossil remains of Epirigenys lokonensis. Drawing and photographs illustrate the evolutionary transition of the upper molar from an anthracothere (left), Epirigenys (middle), and a primitive hippo (right). Black circles are the cusps (main relief of the tooth surface), black lines are the crests, and orange shows the styles (enamel islets). Cetaceans and hippos share a strong relationship in their genes. 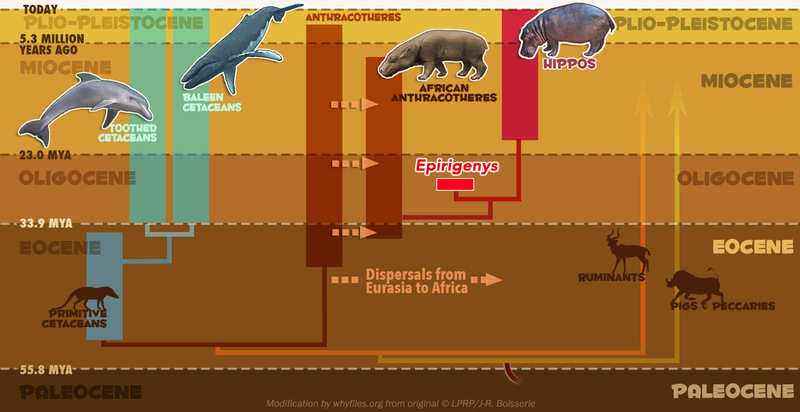 If the ultimate goal is to find a common ancestor of these groups, what structures do modern hippos and whales share? "Nothing at first sight except that they are both mammals," said Lihoreau. "In morphology [structure], where I am very interested, there is nothing you can say that is more similar between them than between other mammals." There is one small similarity, however. Whales and hippos "do not tolerate arid conditions," Lihoreau added. "They can't sweat, so they can't live in the sun. If it's too hot, they need to go in the water, that's the common point of physiology in these two mammals, but we don't know if this is from a common ancestor, or two characters that appeared independently through convergent evolution." In the quest to find the common ancestor of mammals that are obviously so different, the new find cuts the gap from 33 million years to 13 million years. "Thirteen million is an enormous amount of time, but now we know what the primitive hippo looks like, which is important for making further identifications," said Lihoreau. "The hippo and cetaceans are very specialized and very different. You have to have something to look at to see the evolutionary history. If you have a picture of the ancestor of each lineage, it's easier to find the common ancestor." Whale "sonar" an ancient invention!